Any other work taking place and my personal thoughts in relation to the category will also be included in the final section. This report covers 2 weeks due to there being only one contribution in week 48. In week 49, 'miniature-tiger' (who produced 2 analysis contributions during this week), took a look at the distribution of Steem earnings with a view to finding out how much users typically earn through posting and commenting, and if there is an an even distribution of rewards. 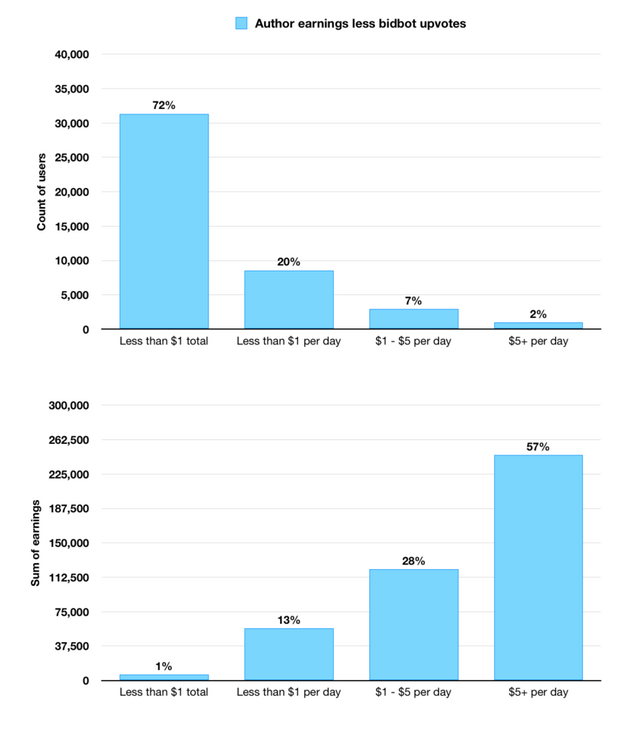 Clearly the distribution of earnings is heavily stacked towards a small percentage of the total Steem accounts. Also in week 49, a new analysis from 'holger80' which focused on Steem full node activity. This monthly report contained a vast number of charts allowing the witnesses running full nodes to compare their servers to other nodes. A technical report, valuable for the witnesses and those seeking the quickest full- nodes to develop against. In summary, I'm really happy to see 6 contributions in week 49 - the best total in a while. 5 of the 6 gained very respectable scores, and only one fell short and took a manual vote because of the limited scope of the analysis. The aim of this section is to represent the current weeks activity along with a recent set of data. The current data span covers the previous 8 weeks. An average score of 75.7 this week (49) almost equal to the 10 week average. 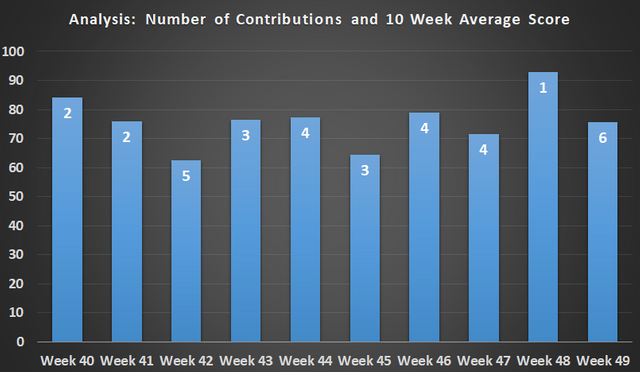 Six contributions is 2 more than any week in the previous 9 and 2.6 higher than the average weekly total. 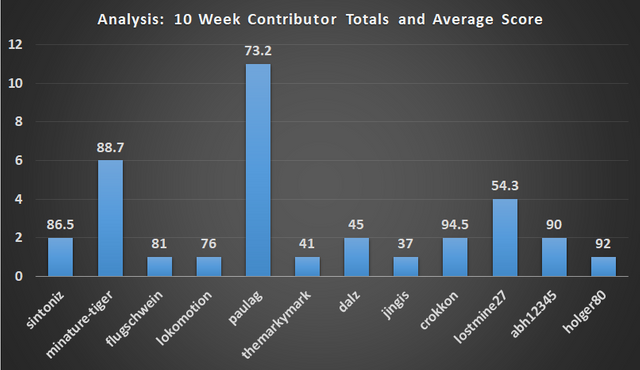 Six contributors have an average contribution score higher than 80 in the past 10 weeks and the category continues to produce a good standard of contribution. 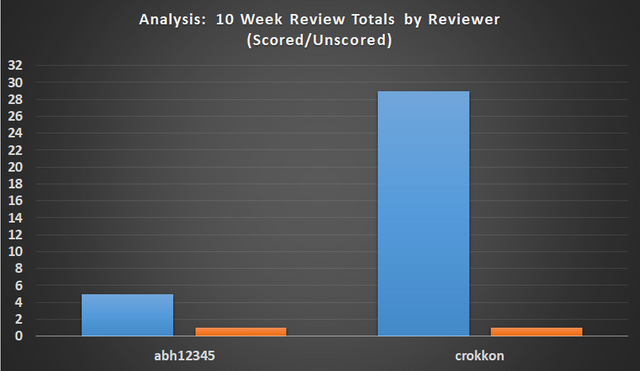 Two reviewers assessed all 34 contributions that received a score in the past 10 weeks. Both reviewers were unable to give a score to 1 contribution each. In a previous weekly report, I discussed possible methods that could be used to try and encourage growth in the analysis category. After discussions in the weekly team meeting, it was decided that approaching previous contributors would be a suitable option. Doing this may boost the number of submissions but perhaps more importantly, provide information as to why previous contributors are no longer submitting to the category. Following this past week, we now have a total of 41 unique contributors to the Analysis category in 2018. 12 of these contributors have submitted work to @utopian-io in the past two months, and so it could be said that almost 75% of the unique contributors to @utopian-io this year are currently inactive. I will report back on this next week. Hello @abh12345! 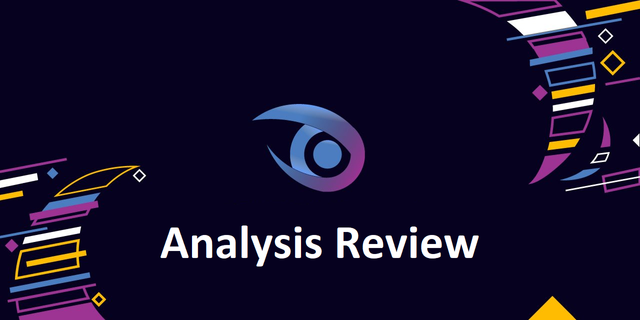 Thank you for the overview of the Analysis category. Quite informative and well-illustrated. I perceive week 49 was a pretty good week. 6 Contributions and 2 got staff picked. That is a good feat despite the current issues in the crypto world. I peeked in some of those contributions, and I see they are really good stuff. I appreciate your effort to grow the category, and I wish you good luck. Yeah last week was the best in months, I hope we can continue the uptrend. Perhaps this weeks call-outs will help, or maybe I'll get 0 feedback. We can but try, cheers! I suspect it is mainly market related. @utopian-io are looking at other ways to reward contributors in the coming months, and I hope that this and a recovery in the wider market will help. With all the talk of the community taking a more controlling approach to the infrastructure of the blockchain, I have found these contributions more valuable as it helps gains understanding of the underlying technology that fuels the ecosystem. I continue to look forward to learning more for a lot of the talent and resources we are privileged to have on the platform sharing knowledge. This one is quite specific to Utopian, but I'm always happy to receive comments from those not directly involved. The current community will hopefully become the backbone here over the next year and reap the rewards of sticking out these tough times. Cheers! Your UA account score is currently 6.751 which ranks you at #111 across all Steem accounts. In our last Algorithmic Curation Round, consisting of 216 contributions, your post is ranked at #212.